In this first week of the Festive Season, SFJAZZ presents the Jason Marsalis Vibes Quartet – showcasing the talents of yet another talented member of the extraordinarily gifted Marsalis family – who in 2011 were the recipients of an NEA Jazz Master award. Originally a drummer on the New Orleans jazz scene, Jason’s versatility includes a stretch with the Marcus Roberts Trio, the co-founding of an Afro-Caribbean jazz combo, Los Hombres Caliente, with percussionist Bill Summers and trumpeter Irvin Mayfield, a highly impressive list of recordings, and he has also performed internationally with conductor Seiji Ozawa in interpretations of Gershwin’s Rhapsody in Blue and Concerto in F.
Having turned his attention to the vibraphone in recent years, Jason formed his Vibes Quartet, with Austin Johnson on piano, Will Goble on bass and Dave Potter on drums. The Quartet focuses on original material by Marsalis, but also explores a wide range of material which includes compositions by Bobby Hutcherson and Hermeto Pascoal, and has now produced two albums – A World of Mallets in 2013, and most recently, an album entitled 21st Century Trad Band. This entry was posted in Articles, Press and tagged Austin Johnson, Bobby Hutcherson, Dave Potter, Examiner, examiner.com, Gilly Lloyd, Hermeto Pascoal, Jason Marsalis Vibes Quartet, Marcus Roberts Trio, Marsalis family, NEA Jazz Masters, SFJAZZ, The 21st Century Trad Band, Will Goble on December 4, 2014 by abell. For a jazz musician, hailing from the Marsalis family carries obvious benefits, and certain specific challenges. With the achievement bar set dauntingly high, Marsalis siblings risk being ridiculed or simply ignored if they don’t measure up. Jason Marsalis, the youngest of the illustrious New Orleans clan of musicians who were collectively named NEA Jazz Masters in 2011, defied long odds by racking up a singular set of accomplishments unequaled by his father, pianist and educator Ellis Marsalis, and his older brothers, saxophonist Branford, trumpeter Wynton and trombonist/producer Delfeayo. A standout drummer as a teenager who went on to play an essential role in two celebrated ensembles, the Marcus Roberts Trio and Los Hombres Calientes, he’s come into his own as a bandleader playing an entirely different instrument, the vibraphone. The Jason Marsalis Vibes Quartet opens a four-night run at the SFJazz Center’s Joe Henderson Lab on Dec. 4. Marsalis recently released his second album with the Vibes Quartet, “21st Century Trad Band” (Basin Street Records), and the project is something of a manifesto. Featuring an excellent but still evolving young band with pianist Austin Johnson, bassist Will Goble and drummer David Potter, the group is very much a reflection of Marsalis’ chronologically encompassing aesthetic. In jazz, “trad” means traditional New Orleans jazz from the first decades of the 20th century. While the style came to be called Dixieland when it experienced a popular revival decades later, in New Orleans the polyphonic group improvisation associated with trad was never eclipsed by later developments like big band swing and bebop. But few jazz musicians of Marsalis’ generation (or the two or three previous) are familiar with trad. He found his current crew, all of whom hail from North Carolina, as impressionable undergrads at Florida State University, where he was an artist in residence with the Marcus Roberts Trio in 2003. More than anything, Marsalis’ beautifully calibrated group approach flows from his formative experience with pianist Marcus Roberts, who spent nearly a decade in Wynton Marsalis’ band. Jason joined Roberts’ trio at 17 as a drummer, and he’s played a crucial role in the development of the group’s balletic control of dynamics, tempo and texture. If Roberts instilled in Marsalis an orchestral and narrative approach to the trap set, his experience in Los Hombres Calientes, which he cofounded with Headhunters percussionist Bill Summers and trumpeter Irvin Mayfield, provided a high-performance vehicle designed to explore the African rhythm continuum from the motherland to the vast New World African Diaspora. Just because he’s turned over the drum kit to another player in the Vibes Quartet doesn’t mean he isn’t acutely attuned to every rhythmic detail. He took drummer Dave Potter under his wing when the young percussionist started asking him questions. It’s a high-pressure situation for a young player, but Potter has embraced the challenge, and most nights he’s flourishing. And if the drummer’s taking care of business, a jazz band is more than halfway home. This entry was posted in Articles, Press and tagged afro-cuban, Andrew Gilbert, Austin Johnson, Brazilian, David Potter, Ellis Marsalis, Florida State University, Haitian, Marcus Roberts Trio, Marsalis family, Mercury News, NEA Jazz Masters, North Carolina, San Francisco, San Jose, SFJAZZ, SFJAZZ Center, The 21st Century Trad Band, Will Goble, world music on December 2, 2014 by abell. The most immediately arresting aspect of last night’s performance by Jason Marsalis at the Phelps-Stokes Auditorium of Berea College was the profoundly cool sound he summoned from the instrument before him. Known through area concerts over the past two decades as a drummer (including a 2005 show on this very stage), the youngest sibling of New Orleans’ famed Marsalis family favored the vibraphone and the melodically lustrous but sonically reserved tone it conjured. On the opening bars of Blues Can Be Abstract, Too, the vibraphone’s notes hung liked chilled colors in the air that grew more expansive when Marsalis chose to add pedal induced sustain. The tune served as a beautiful introduction not only to the instrument but to what the bandleader chose to do with it. Fronting what he aptly calls his Vibes Quartet, Marsalis flirted with jazz tradition and tried out more than a few progressive ideas. But that hardly translated into the big band majesty Lionel Ham\pton brought to the instrument from the 1930s onward or the scholarly combo improvisations defined a generation later by Gary Burton. Aside from a few fleeting passages where Burton’s innovations in playing the vibes with four mallets instead of the usual two surfaced, Marsalis followed his own muses, including a few from his native New Orleans. On Blues for Now, one of eight com positions performed from the Vibes Quartet’s second and newest album, The 21st Century Trad Band, a rugged Marsalis solo on the vibes led into a tight trio run instigated by pianist Austin Johnson. The music became noticeably more playful during the checklist of conflicting grooves that set the stage for The Man with Two Left Feet and its jovial percussive breakdown from drummer David Porter. And for pure Southern melody, nothing beat the curiously titled 18th Letter of Silence where a sunny vibes stride by Marsalis quickly served as a contrast to the dynamics of his rhythm section. Johnson got the lion’s share of the solo spotlight but Potter and bassist Will Goble drove the tune. Ultimately, it was the show-closing title composition to The 21st Century Trad Band that defined the performance with a mash-up of familiar melodies (When the Saints Go Marching In was the most detectable), twisted bits of swing and some furious syncopation. The elements may have been rooted in the past but the end results brought the music into the here and now with the tonal splendor of the vibes leading the charge. This entry was posted in Press, Reviews and tagged 18th Letter of Silence, Austin Johnson, Berea, Blues Can Be Abstract, David Porter, Jason Marsalis Vibes Quartet, Kentucky, LexGo, Lexington, Phelps-Stokes Auditorium, The 21st Century Trad Band, The Man With Two Left Feet, Too, Walnter Tunes, Will Goble on November 14, 2014 by abell. As the album title The 21st Century Trad Band suggests, Jason Marsalis’ quartet mixes modern-day sounds with traditional ones. The title track includes a quote from the most traditional of tunes, “When The Saints Go Marching In,” while the song “BP Shakedown” begins with a recording of Rep. Joe Barton’s comments on the federal government’s response to the 2010 oil spill in the Gulf of Mexico. 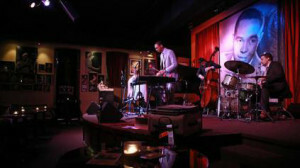 Marsalis, who topped the category Rising Star–Vibraphone in the 2013 DownBeat Critics Poll, has surrounded himself with fantastic musicians: pianist Austin Johnson, bassist Will Goble and drummer David Potter. Some of the album’s tracks feature the so-called Discipline Ensemble—Marsalis on marimba, glockenspiel, tubular bells, vibraphone and xylophone—but this is truly a band effort. The quartet has fashioned a strong album with an appeal that extends beyond the thrill of hearing a master of the mallets at work. One section of “Ratio Man” shows just how killer this band can be as a trio (when Marsalis isn’t playing). Marsalis’ tune “Nights In Brooklyn,” which has the feel of a film-noir soundtrack, features Potter’s supple brushwork and Johnson’s gorgeous piano lines. This album showcases Marsalis’ command of the vibraphone’s melodic and percussive qualities, as well as the leader’s eagerness to share the spotlight with his fine collaborators. This entry was posted in Press, Reviews and tagged Austin Johnson, Bobby Reed, BP Shakedown, Critics Poll, David Potter, Discipline Ensemble, DownBeat, Jason Marsalis, Nights in Brooklyn, Ratio Man, The 21st Century Trad Band, When The Saints Go Marching In, Will Goble on November 1, 2014 by abell. This entry was posted in Press, Reviews and tagged Austin Johnson, Best of 2014, Cliff Hines, Dave Summer, David Potter, Jason Marsalis, New Orleans musician, The 21st Century Trad Band, Will Goble, Wondering Sound on October 29, 2014 by abell. 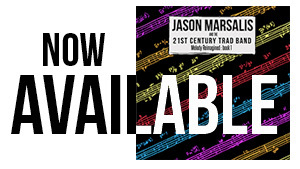 Jason Marsalis (@JasonMarsalis) Vibes Quartet ‘The 21st Century Trad Band’ Album Out Now + LIVE on Tour! With songs on the album like “Offbeat Personality” Marsalis takes us on a journey through a complex arrangement combining hard-swinging sections with more melodic interludes, unexpected turn-arounds, and an introspective outro. While songs like “The Man With Two Left Feet” and the titular track play with the trad jazz idiom in a contemporary modality. What’s clear throughout the album is the developed control the band has cultivated through further years of playing together; the unspoken communication is evident. 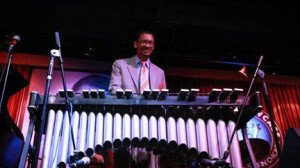 As with previous albums, Marsalis continues his “Discipline” series accompanying himself on a variety of mallet-based instruments including Marimba, Glockenspiel, Tubular Bells, Vibraphone, and Xylophone, further establishing his voice as a mallet-player with the off-kilter blues of “Discipline Meets the Offbeat One” and several interludes with unusual rhythmic patterns and meters. In addition to including original compositions from his band mates, Marsalis has taken a step further in encouraging the vanguard of the next generation of jazz by including compositions of the young New Orleans musicians Cliff Hines (“Interzone”) and Jasen Weaver (“Blues for Now”), both graduates of the New Orleans Center for Creative Arts. Banjoist Bela Fleck has praised Marsalis for “brilliant ideas that sound as if he’s played them his whole life, but are really coming off the top of his head.” The NEA Jazzmaster stated himself that his last record was “the beginning of a new chapter.” It’s clear The 21st Century Trad Band is a continuation of that chapter, and it’s full of those “brilliant ideas” for which the bandleader has become known. This entry was posted in Press, Reviews and tagged Austin Johnson, Basin Street Records, BP Shakedown, David Potter, Discipline Meets the Offbeat One, Jason Marsalis, JazzWeek, NEA Jazzmaster, Nights in Brooklyn, Offbeat Personality, Ratio Man, RJ Frometa, The 21st Century Trad Band, The Man With Two Left Feet, Vents, Will Goble on October 28, 2014 by abell.